Q: I own a four-year-old Palomino gelding. Where I board there is no grass. Is there anything I can give him to keep him busy so he doesn’t eat bark and sand or develop vices? A: Although the ideal environment for a horse is to live outside on green pasture with his herd of four-legged pals, that’s not the lifestyle many of them lead. The average boarding stable doesn’t have access to pasture grass. In fact, out here in the southwest, horses rarely get an opportunity to graze. Fortunately, domesticated horses are extremely adaptable. Providing they’re properly managed they can lead happy lives stabled in barns or corrals without developing destructive vices. Some horses, however, need a little bit of extra attention. 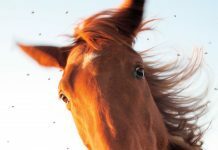 Young horses like yours or those who recently transitioned from pasture to barn often benefit from the following suggestions. To prevent your horse from scrounging around in the sand, consider putting heavy-duty rubber mats in his corral or stall, especially where he’s fed. That way he’s less likely to pick up sand as he forages for leftovers. Speak to your vet about possibly adding a psyllium supplement to some pelleted feed on a regular basis to help transport any sand that does accumulate in his digestive tract. If your young gelding seems to be fond of de-barking trees, you can remove the temptation by wrapping the tree trunks with wire or a special type of plastic webbing available at nurseries and home improvement stores. Another way to keep him busy between meals is to purchase roll around stall toys that contain treats inside. In order to obtain the cookie, the horse has to spend time figuring out the puzzle, manipulating it with his mouth and nose. If your horse seems like a midday snacker, inquire at your boarding stable about a lunch program. 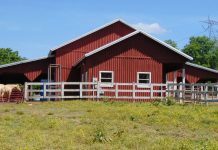 For a nominal fee most barns will toss your horse a flake of grass hay or a scoop of pellets in the afternoon. Or, if possible, personally take more control of his feeding regimen. 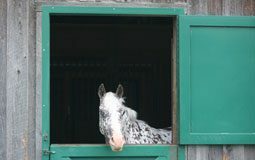 Sometimes dividing your horse’s daily ration of feed into three or four small meals will keep his tummy full, thereby keeping him out of mischief. Plus, this feeding method is closer to the natural rhythm of eating that pastured horses enjoy. Finally, if you really want to make the extra effort, you can do what some race horse owners do: buy several flats of quality Bermuda grass at your local nursery. Set them on the ground and hold your horse in his halter and lead while he chows down on his super-sized squares of greenery. Bon appétit! I put hay in very tiny bunch under the fence line, or in small piles so my in-pen, horses have to walk around to eat. Also a friend, like a small goat, or mini will help your horse not be so lonely. It is always best that your horse has constant access to hay, but if that is not possible make sure he gets some at least three times a day. You can get him toys to keep him entertained, like the roll-around ones mentioned in the article, and he may also like Likit brand treat toys. He should always have access to a salt block-my horses prefer the himalayan rock salt blocks. One option is to invest in a slow feeder. I think they do their job very well, and I believe your horse will be happier and healthier too. my horses ate all the grass from our fields, whatI did was build 3 slow feeders and it takes them most of the day to eat their hay..
Those slow feeders sound like they work very well.